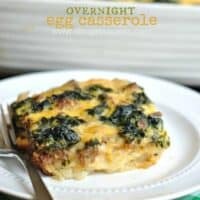 Delicious, cheesy Egg Casserole, can be made the night before. 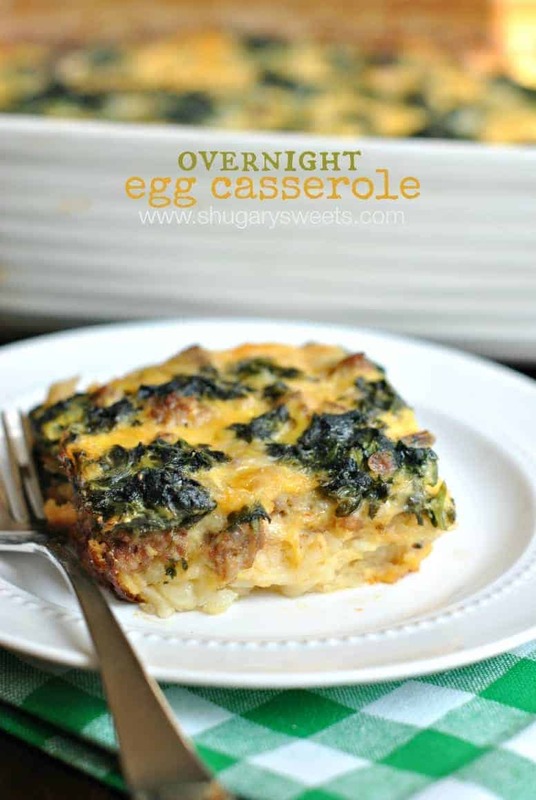 Put in the oven in the morning and enjoy this hearty breakfast! 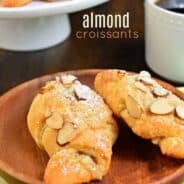 Click HERE to save recipe to pinterest! I love brunch. Well, I love food, but I especially love brunch food. You can eat things like overnight egg casseroles, but you can also eat french toast and cupcakes and ham and roast beef. Pretty much anything goes when it falls in the brunch category. 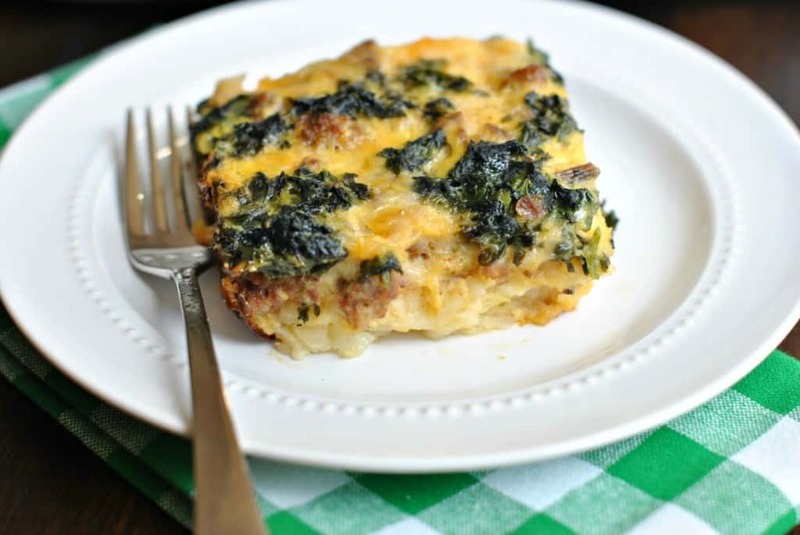 Today’s recipe is one of my favorite egg casserole recipes. Depending on the meat you have available (I have used ham, bacon and sausage…this one is made with sausage), you can change up the flavor. You can also make it vegetarian and only use your favorite vegetables (broccoli, onion, peppers, spinach and tomato). I like to use a little combo of both a meat and a vegetable. Today I used pork sausage and spinach. Yum. First decide if you will be using meat, veggies, or both! If using meat, make sure it is precooked. This is a great use for leftover ham during the holidays! Line the bottom of your casserole dish with hashbrown patties. If you can’t find them in the freezer section, you can substitute tator tots of the bottom layer! Next cover the hashbrowns with your meat, veggies and cheese! You’ll want to mix up the eggs with the remaining ingredients and pour this over your meat and cheese. Cover with foil and place in the refrigerator overnight. In the morning, pop the covered dish into the oven. It’s a hearty meal that takes nearly two hours to bake, so plan accordingly! If you’d like to eat this for a “breakfast for dinner” make it in the morning, refrigerate all day, then put it in the oven for dinner. ENJOY. Get your day started with this hearty Sausage and Gravy Breakfast Casserole! Best part? It can be made ahead of time! This Fireman’s Overnight Breakfast Casserole recipe from Garnish with Lemon is packed with sausage and veggies and topped with a creamy mushroom sauce! Brunch isn’t complete unless you’ve made a batch of these Perfect Instant Pot Hard Boiled Eggs. They peel so easily, and are perfect for deviled eggs, egg salad, and much more! Erin from Well Plated has this Everything Bagel Breakfast Casserole. 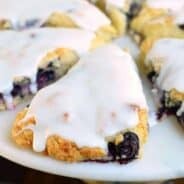 You’ll have to try it for yourself, but it has the cream cheese in it, and it looks amazing! Serve up a batch of these Greek Omelets for your guests this holiday. Perfect with a side of homemade tzatziki sauce! Place frozen hash browns in bottom of 13x9 casserole dish. Cover with meat (or veggies) and cheese. Beat milk and eggs, add soup and spices. Pour over meat/cheese and top with additional cheese if desired. Cover and refrigerate overnight (or if making for dinner, refrigerate during the day to be cooked later). Bake covered 1 hour at 325 degrees, uncover and bake an additional 45-60 minutes. Your Egg Casserole is a great dish for company and just looks delicious. Thank you so much for sharing with Full Plate Thursday and hope to see you next week! I am your newest follower! I love breakfast casseroles! This is a great on for an Easter brunch! @ Carla- let me know if they like it! @ Miz Helen- thanks for hosting and stopping by! @ Kate- It’s perfect for Easter brunch, enjoy! I have to be honest, I have never seen cream of celery soup in a egg casserole before – it intrigues me. Looks delicious too! This sounds like it would be delicius with the spinach and sausage. 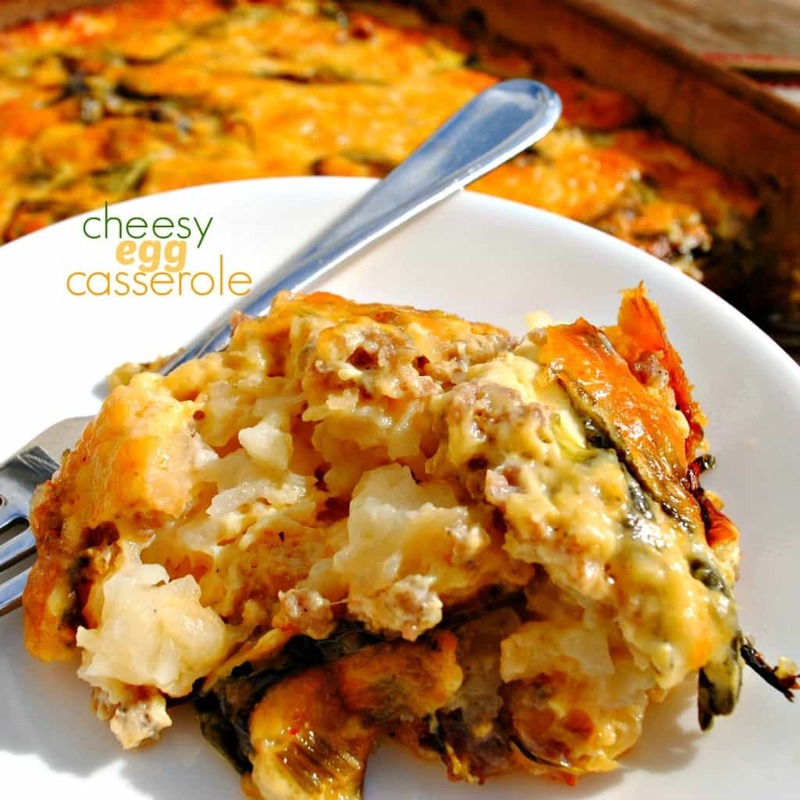 We love breakfast casseroles too (I also just posted one :)) Thanks for sharing yor recipe. Love brunch food as well! That’s my favorite meal : ) I know my husband would love this (and me too!) Thanks! That just looks fantastic. What a great thing for an Easter brunch. Thanks for linking up. My family would gobble this up. I will have to make it soon. Thanks for entering my sausage link-along. Please return and vote for your favorite recipe. I will feature the winner with a separate post that includes me preparing the winner’s recipe. Just 1 question How come it takes so long on cooking of the meat is already cooked? Everything has been refrigerated and comes out of the refrigerator cold. I really love to eat cheddar cheese and toaster hash browns. 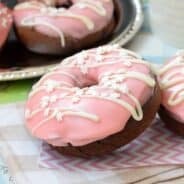 So delicious and healthy recipe. Will make it soon.